Halloween or the Market? Which is more scary? Scary spooky stuff. At the end of the month, we do it with makeup and costumes. All year along, the market can be affected by ghosts and goblins. A fundamental law of economics is the theory of supply and demand. When demand is strong and supply is low, prices rise. When demand is weak and supply is high, prices decline. Easy to understand. But what do we do when supply is strong, and demand is high, and prices don’t rise significantly? Someone is breaking the law. Goblins? Let’s look at the Conejo Valley first. Inventory is down, 14% from a year ago, but how does that compare to recent history? Inventory is low, the lowest for this period in the past five years, 14% lower than last year. Sales continue strong, although down 2% from a year ago, leading some to argue that more sales could take place if only we had the inventory available. Inventory and sales level have to be taken in comparison to one another. Without both, you have something like a ball game where the score is Dodgers 6. You need to know both sides. One way to look at this relationship is to determine how long the inventory would last at the current rate of sales. Historically housing economists considered a balanced market, one which favors neither the buyer or the seller, around 6 months worth of sales. We have been living with 2 months worth of sales for a couple of years. Communities near the California coast should probably experience a lower number, but at 2 months almost everyone would agree we are in a sellers market. That is a market where the seller rules, multiple offers are common, appraisals are not supporting the contract price, and a type of buyer frenzy exists. Until recently, that has not been the case, but it appears to finally be adjusting. Compared to the same three months of 2016, average prices are up 7%, median prices are up 10%. This is over a three month period. year to year. So what is going on? The pot should be boiling, and the lid finally appears to be bouncing off the pot. Or is it a pressure cooker? Was there a strong force keeping prices down? I think that the lid is provided by wages. Wages limit how much a buyer can obtain in a mortgage. We have had extremely low interest rates for many years now, but wages have not risen substantially. Until wages do climb, buyers are limited as to how much house they can afford. It seems as though buyers are spending as much as they can, and they cannot pay a higher price than what they can afford. The price an individual can pay is based on income and the mortgage interest rate. We do have multiple offers, but often the multiple offers are not exceeding the listing price of the home, or maybe more accurately the price at which the market currently values the home. Although we are going into a slower period of the year when sales tend to decline, it appears that all the talk of raising interest rates may have finally moved some buyers to act. This has a lot to do with how much people make. 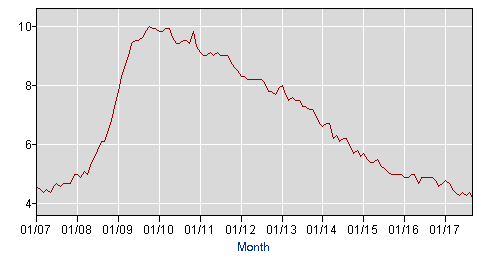 Let’s look at the unemployment rate and the rise in wages. 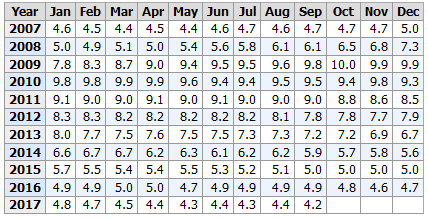 The unemployment rate in September fell to 4.2%, far lower than the Fed usually likes to see it. At that rate, which they term full employment, they start raising interest rates to control inflation. However, not much inflation is taking place. Yet. When the unemployment rate is this low, businesses have a difficult time finding workers. Eventually they have to pay more to attract those workers. 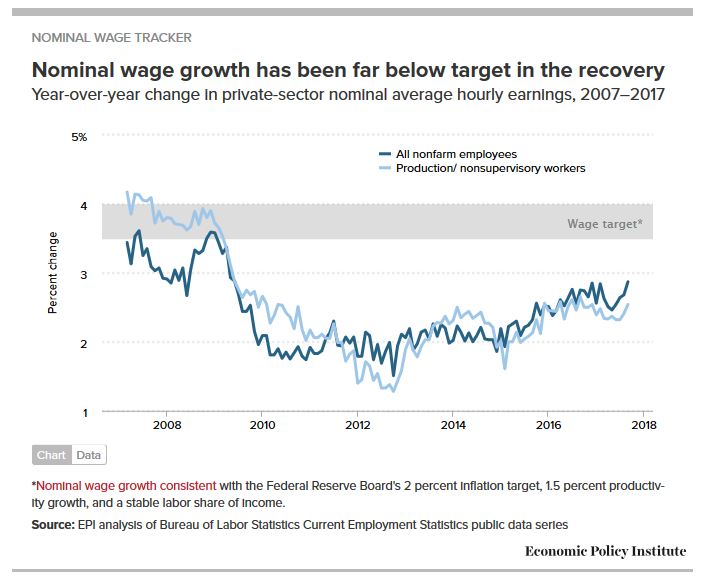 However, we have not seen wage growth take place, and it is currently similar to the rate of inflation. Workers might make more money, but since goods and services cost more, they don’t get ahead. Usually this low an unemployment rate causes a healthy rise in wages. But today that is not working. Yet. When wages are barely keeping up with inflation, there is not that jump in earnings to lead people to decide to buy a home. Although housing prices are not rocketing skyward, rents keeps increasing at around 5% per year, so renters cost of housing is rising more than their wages. All this creates reasons for apartment dwellers to move from their apartment to a home that they can own, but it is not yet taking place. It should, but it’s not. The current lack of inventory is not causing home prices to rise because the buyers have not seen their wages increase, and they can only afford what they can afford. The frenzy of a seller’s market is missing. People are not in bidding wars, they are negotiating. 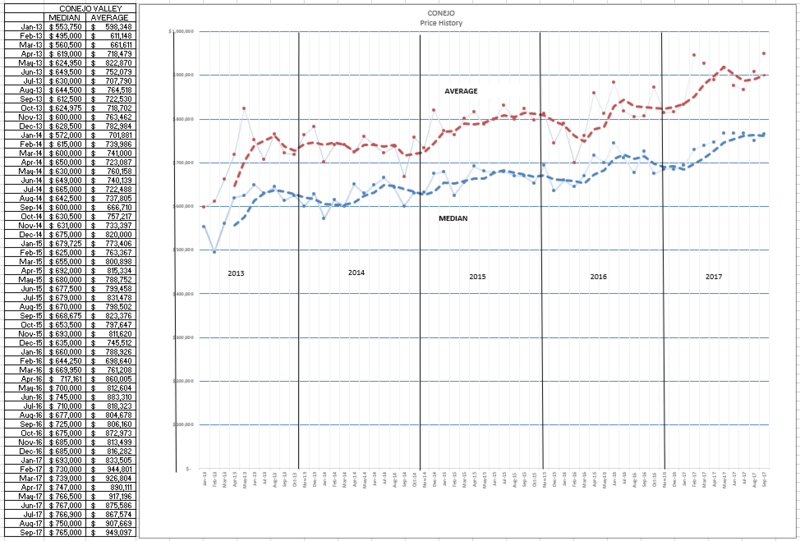 Let’s look at how prices are behaving, month to month. One thing you can visualize in the chart below is the seasonality of prices. Similar to the inventory chart, prices tend to rise in the summer, but do soften as the year is ending. It is by no means a straight line. Looking at the current year, we could see the strong increase in prices in the first few months of the year, then a leveling off, and we seem to be experiencing a lowering of prices as we head toward the end of the year. If the low inventory, as measured by the months of sales it represents, is not causing prices to rise dramatically, then it seems that at current prices the housing demand is in balance with the housing inventory, even though that supply is historically low. Let’s see what is happening in Simi Valley and Moorpark. Much the same story. Inventory down an impressive 21%. Prices up 5-6%, and the number of sales actually increased over a year ago, by 3%. The inventory is frightfully low, only 1.4 months of supply. If we sold off everything, it would only take 6 weeks, and only 4 weeks of inventory for homes priced below $750,000. So why are prices increasing only 5-6%? Again, the only thing I can offer to you is that lid on the market due to lack of wage growth. 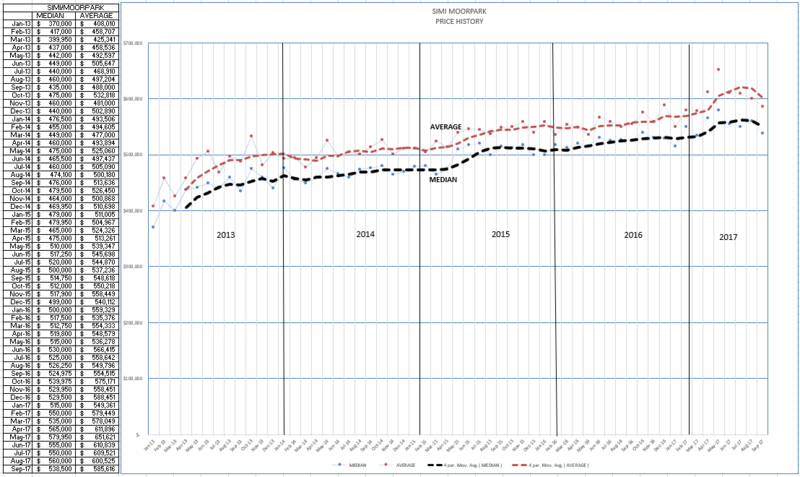 Let’s see how prices have actually been changing in Simi Valley and Moorpark. Looking only at this year, a very strong climb in prices. However, that increase was after prices dipped at the end of last year. Yes, there is seasonality, and we are seeing prices soften and decrease between now and the end of the year. 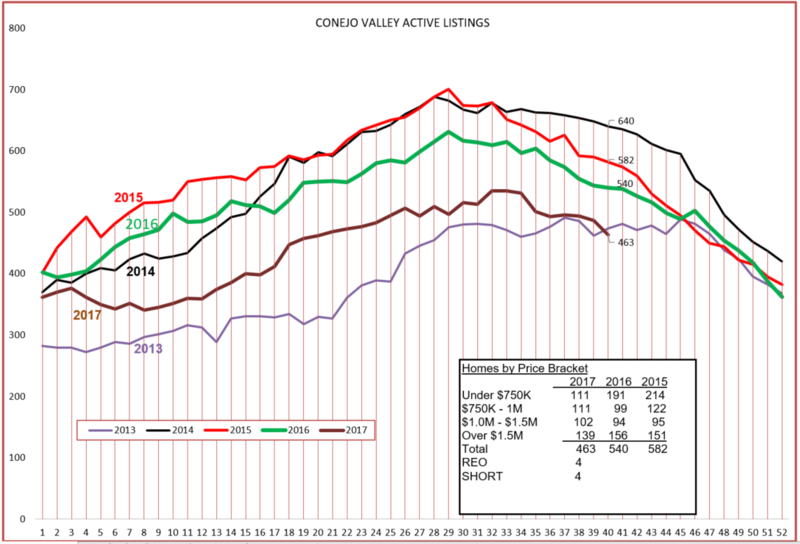 Similar to Conejo, the inventory is low, very low. . 2013 was a year of high home price inflation. 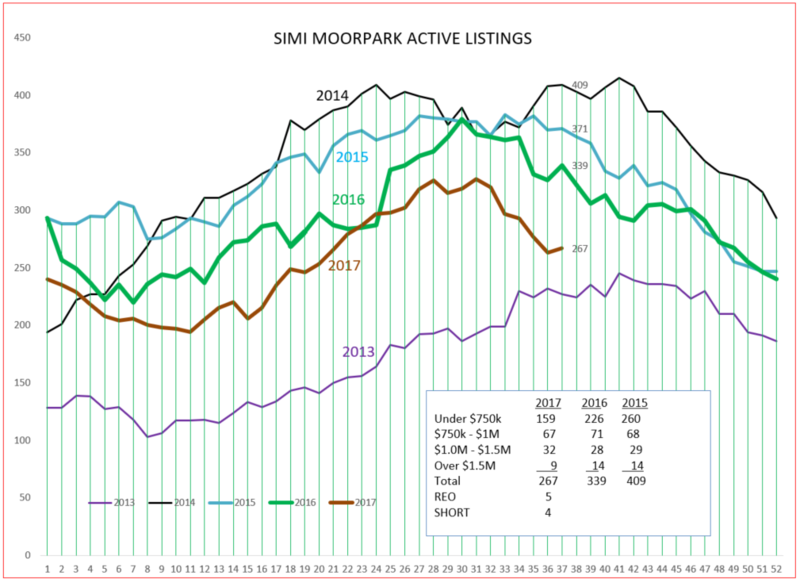 Simi Moorpark has an inventory that is almost as low as 2013, a year of very high home price inflation. The economy is complex, much too complex to explain away with a few factors and a couple of graphs, and more factors are on the way. For now, prices are on the way up, due the low inventory and the strong demand. if the tax reduction plan adds money to everyone’s pocket, spending will increase. But if the government decides on doubling the standard deduction, it will potentially take away some of the attractiveness of home ownership. Our associations are lobbying strongly. We want lower taxes, but not at the expense of the tax incentive to home ownership. We want to protect the economic tax benefit of home ownership. The next few months should shed a great deal of light on where this market is headed. At this point, the one thing I suggest you pay attention to is wage growth. If you see wages growing, you may quickly see home prices growing and potentially a growth in the number of sales. As new homeowners buy, those with equity tend to move up to more expensive (although not necessarily larger) homes. It will be an exciting year.